I'd caught quite a few pike, and become a dab hand at unhooking them, even if they had swallowed the bait. I found myself unhooking fish for other people, catching bait, taking photos... But I was stuck in jack-land, I couldn't beat my best of 10lb 8oz. Then it happened, for some reason I knew it was going to be a monster from the moment the float bobbed. With shaky legs I played the fish in and beached it on the muddy bank. Unhooking duties were complete by the time my Dad arrived for weighing and photos. 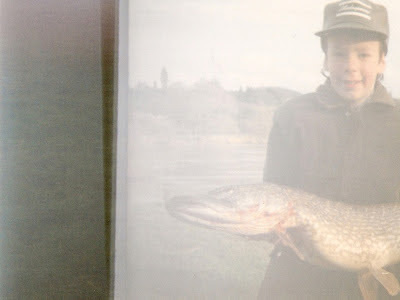 Scales weren't great but I think we settled on 12lb, a proper pike! A quick photo before she was released and I headed home to file an extensive report with my Mum, brother and my fishing pal Steve. There were six or seven photos left on the film which I quickly used up photographing the cat. Time for a dilemma... I could get the photos developed the next day in town, but if I sent them off it would take 10 days but I'd get a free film - I opted for the second. The photos arrived... And... Gutted... Still, it was the only one on the film that came out at all. A new camera was top of the Christmas list that year! Well, the season has been a shocker so far, only 5 pike landed and only 3 of those by design. The river has been too high to present a bait well at Penton Hook since October, most trips being cancelled before they've begun. And the Wye was completely flooded out over Christmas - I do prefer fishing in rivers. But the river levels have dropped and hopefully this cold snap will make the bait-fish shoal up (a flood tends to spread them out). So fingers crossed for a productive end to the season! How do i contact the writer of Pike Blog please? A great shame that the picture never came out, such was the risk of the film camera. I have to smile though thinking back to how much anticipation there was in getting to see the pictures when they were developed. Another fun fishing related feeling thats pretty much gone now with the advent of the digital era. Wouldn't want to go back to film though!! Ah the days when you'd either have your head cut off or you'd be a spec in the background of the photo. I don't miss those days at all.